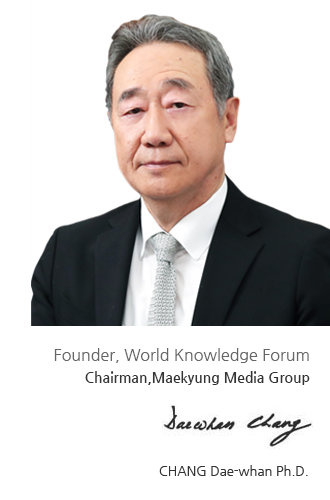 This year marks the 19th Anniversary of the World Knowledge Forum. Thanks to the benevolent support and enthusiasm from many knowledge seekers around the world, the World Knowledge Forum has grown into one of the most prominent knowledge symposiums in the world. The World Knowledge Forum has successfully tackled new challenges each year, and as a result it has rewritten the history of the forum industry for over a decade. In order to meet the expectations of many who await the World Knowledge Forum every October, we have yet again prepared an array of speakers and themes that are surely worth anticipating. The World Knowledge Forum never fails to reflect the timely trends and agendas of the world. As a result, we are confident that our forums have set the bar high for other forums on a global scale. The World Knowledge Forum will once again provide attendees the opportunity to experience a new spectrum of knowledge like no other. The world is entering a state of pandemonium. We are facing challenges like never before in political, economic, and societal realms. The global order that was once accepted without any doubt is starting to collapse before our eyes. Thus, the key to overcome such state of chaos is through collective intelligence. Since its inception in 2000, the World Knowledge Forum has devoted itself to sharing knowledge with the belief that it is the sole way to ensure the prosperity of humanity. At present, we are in dire need of such efforts for a better future ahead. This year, esteemed power elites and global scholars from various fields will provide knowledge and insights to search for ways to guide the world away from pandemonium and towards prosperity.